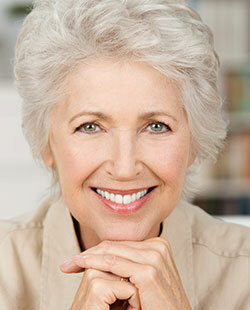 For many patients with missing teeth, standard dentures are the best option. 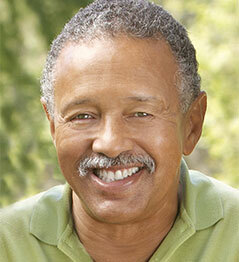 Dr. Leach takes pride in designing and fitting beautiful-looking dentures that don’t slip! How? The secret is in the fit. Properly designed dentures “grip” the gums to stay in place, giving you confidence while eating or talking, and keeping the smile on your face. We use the word “traditional” to describe what most people think of when they hear the word dentures. This is a full set of replacement teeth that can be placed in your mouth, and then removed, without a physical anchor. A partial denture can be clipped on to existing teeth and fill the space left by more than one missing tooth in a row. Other options include bridges, which use crowns to hold the replacements in place for a couple of missing teeth; overdentures, where dentures snap on to implants placed in the jawbone; and dental implants, which can permanently replace one tooth or all of them. If you think about dentures that you feel don’t look like they suit the person’s face, or dentures that move around and make noise when the person talks, you’re probably thinking about economy dentures. These are made for the lowest cost and can do the job, but not well. Soreness and embarrassment often result, and they don’t serve to keep the mouth healthy over time. As jawbone recedes, these dentures fit more and more poorly. They wear out faster, too, which sometimes makes them less affordable than they seem. Custom dentures are specially designed for your mouth and fit so well because natural suction holds them in place. To help you keep looking like yourself and avoid that “sunken” appearance, they suit and support your facial structures. When they fit right, you don’t need to use adhesive! They’re also more comfortable. We use high-quality materials so people won’t even know you’re wearing dentures unless you take them out and show them. Contact us at (423) 586-3432 for a free consultation to discuss how we can make you beautiful, comfortable dentures that will keep you smiling!